The writer of this article I introduce today was born in 1972, a boxer when he was young. 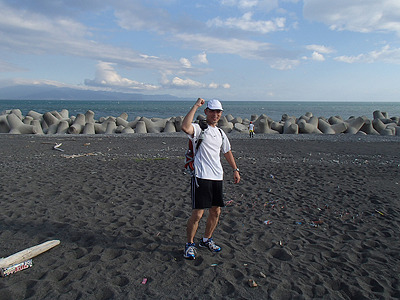 He still runs like 200 kilometers sometimes, so he is still a kind of accomplished athlete. 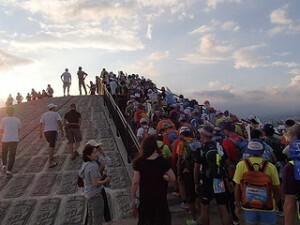 At the end of August, a marathon event was held near Mt. 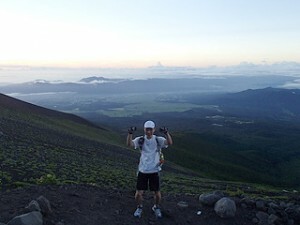 Fuji, which course is from a seaside to the top of Mt.Fuji and back again, he took part in that event. 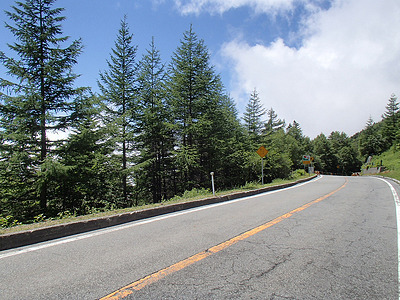 The event has 24 hours of time limit, so the participants have to finish the round trip course within 24 hours from the start time. It sounds so hard, but can he finish within the time? Let’s see anyway, here is his report. 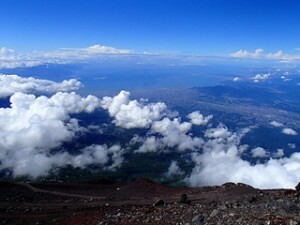 The course of “10th Mt. Fuji round trip maranic 2012” is from Tagonoura seacoast in Fuji city, Shizuoka prefecture, to the mountaintop of the Mt.Fuji, and, from the top of the mountain to the seacoast in 24 hours, its distance of 112 km. This is he. Do you think he can finish 112 km in 24 hours? The start time was 18:00 on 4th of August. This is the start point. About 100 participants started together. There was no place to leave their hand stuff at the start point, even on the way. People had to carry their own stuff such as water, some food, and clothes themselves. 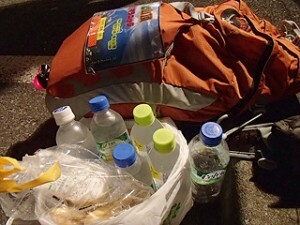 He usually drinks a lot of water while running, so he purchased 3 liters of water at the convenience store, and prepared some clothes, cell phone, batteries, cameras, medicines, lights, etc. Probably his luggage reached almost 10 kg of weight. 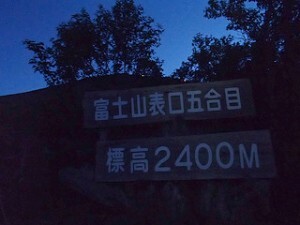 After passing 25 km point, there was no street light, and everyone was cloaked in darkness. People ran in the darkness carrying their own flashlight. 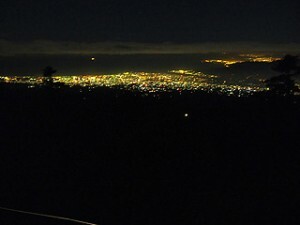 Beautiful night view. 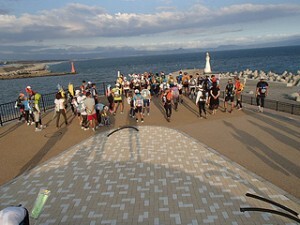 They are around the start point. The 5th check point, about 50 km from the start. 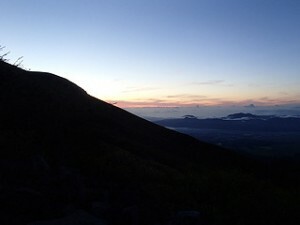 Right before dawn broke, he arrived at 5th station on Fuji. 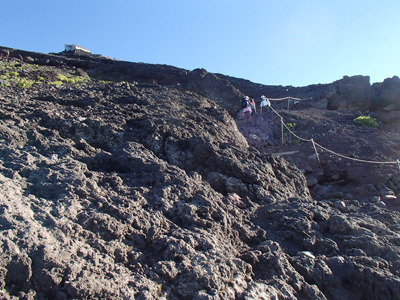 From there, all the way is covered with big rocks and sands, it would be steep route of the climb. Dawn breaks. Top runners are already going down. It’s getting cooler, but he is still fine. Considering the time limit, he’d better to hurry at this time, but he mustn’t rush because it’s risky. 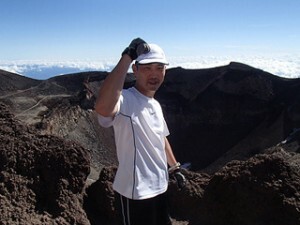 He got close to the mountain top step by step. 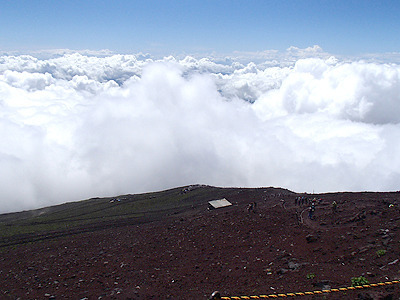 The air got thin in this height, and there were many people walking on the way. Taking his time, finally he arrived on the top! He is on the mountain top. But the highest point is over there. 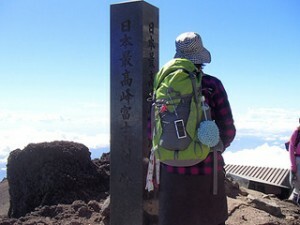 He left his luggage here, and walked forward to the highest point “Kengamine”. What a nice view! This is the top point. 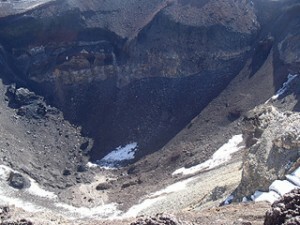 The crater of the volcano. He still looks fine. It was 8:50AM at the top. After taking a little break at the top, he started going down toward the goal. 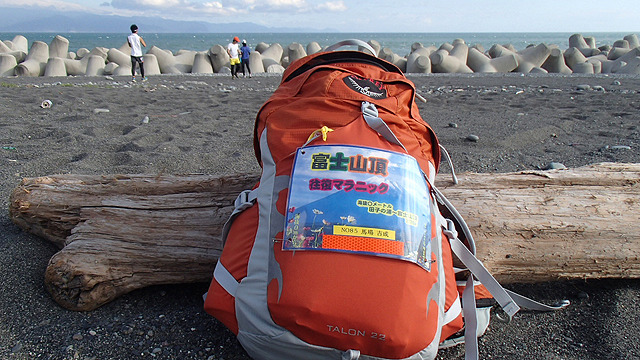 It remained only 8 hours and half to reach the goal at Tagonoura seacoast. About 56 km remained at that point. Yes, he had to hurry. He chose a different route from the way he came, because there were fewer people. But the strategy did not go well. He had to walk on a gravel road, small gravel and sand in shoes hurts his foot, so he couldn’t go forward as he planed. He finally came back to Sky Line at 12:00 noon. He continued running the road as much as he could, but the time was running out. 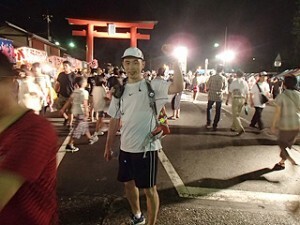 When he arrived at Asama Shrine point, 15km from the goal, it was already 17:10. He had to run 15 km in only 50 minutes. 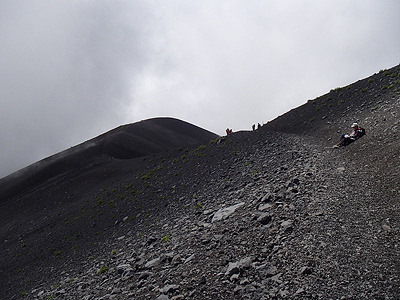 It was not possible for him, because his foot was completely exhausted. He decided to retire the race at that point and told the host about it on the phone. He needed another hour to finish the goal. After deciding firmly that he will finish in time next year, he went a nearest spa and changed his clothes, then went home. Now we have seen his big challenge. What do you think? 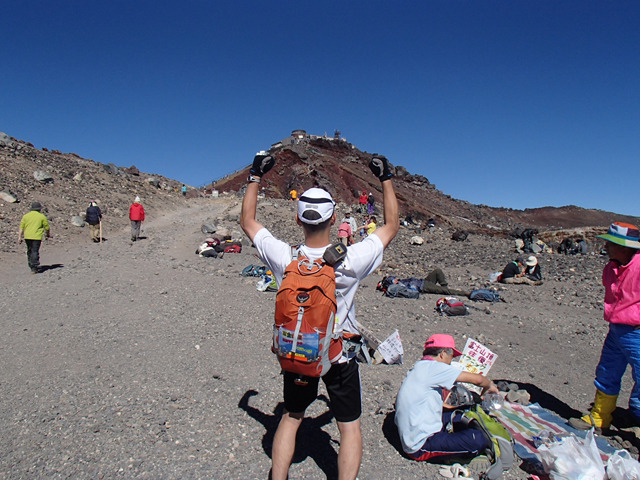 There are few people who can do like this, I cannot even climb on the top of Fuji, so I think he did great and he is a great athlete. I would like to admire him and hope he will achieve his goal next year. I would be grateful if you let me know your great challenge.